Laying sod is the fastest way to get a lush green lawn. It is more expensive than seeding, but unless you are paying for hydroseeding, sod will be a lot easier to take care of than seeding. When you seed yourself, weeds have a chance to grow too, and the grass can take a couple of seasons to fill in completely. When laying sod, it’s very important to do it right. It’s certainly not fun or cheap to redo it. Loosen the soil 4” to 6” deep, this helps the plant grow. If the soil is hard and compact the turf area will always need more care and water. Make sure that there is 4” to 6” of good top soil with organic material. If you have poor soil add top soil to it or till in yard waste compost that’s well composted. When in doubt take a soil sample and send it to a laboratory and see how much sand, silt and clay that you have. Too much of one or the other will give you a idea of what will need to be added. Hint – Top Soil isn’t always black or rock free. Rake everything out sloping away from the house making sure that water will drain out and away fast. Not having the top soil prepared or having enough of it is one of the biggest mistakes people make. Another mistake that’s made is not making sure that there is proper drainage away from the house and through the yard. Stagger your seams, keeping the seems tight and lay your sod horizontal to your slope. This will prevent the water from following the seams down hill and not staying on the sod. If your yard has a steep slope always start laying the sod at the bottom of the slope. If you start at the top the sod will want to slide down as you lay it and this makes for a sodding disaster. Now that the sod is laid spread a good starter fertilizer and water immediately. Depending on the time of year, water two to three times a day for a week, more if needed. Back off watering the second and third week. Check to see if the sod is rooting down by pulling up on a corner of the sod and look for white roots. Most of the time it takes 4 to 6 days for this to cure. If there is ever standing water or a lot of water is running off the sod, back off the watering. The third and fourth week you could water every other day. The best time for sprinkler system installation is before you lay sod. 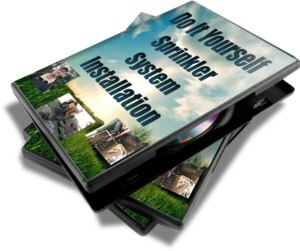 How easy is it to install a sprinkler system?